This Darjeeling from the organic tea division of the Goomtee estate is a fine-looking classic of chestnut leaves with golden accented tips. A light honey muscatel flavor and a balanced nutty briskness linger as a delightful aftertaste. I enjoy a good cup of Darjeeling. The problem is that it’s not always easy to find a good cup of Darjeeling. Actually, there are a lot of *good* Darjeeling teas out there, there just aren’t a lot of Darjeeling teas that stand out above and beyond what I would call an ordinary Darjeeling. And I guess that is always what I’m looking for – an outstanding Darjeeling tea. I guess that is always what I’m looking for – an outstanding Darjeeling tea. It has a delightful honey-like taste to it that comes off as sweet but not sickeningly so. Very clean and crisp tasting with a strong, exhilarating astringency. The nutty quality that the above description eludes to is a very pleasant contrast to the somewhat wine-like muscatel taste of this Darjeeling. One of the more complex Darjeeling teas that I’ve encountered – and as Darjeeling teas are usually complex – that says something! LeafSpa’s teas are all organic. While that isn’t always the deciding factor for me of where I buy a tea, I do prefer to buy organic and I’m glad that LeafSpa is dedicated to providing the highest quality organic teas available. 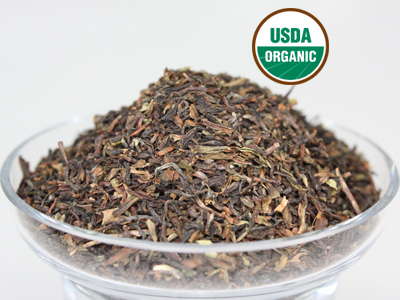 If you like Darjeeling tea, you should really give this one a try. You can thank me later!